In an important article about the ballets created by Frederick Ashton during WWII, Geraldine Morris argues that these five works form a distinct and distinctive group in a career that spanned the conflict:1Geraldine Morris, ‘Ashton’s Ballets of the Second World War’, Dance Research: The Journal of the Society for Dance Research, 26/2 (Winter 2008), 169. The ballets were Dante Sonata (1940; music: Liszt orch. Lambert, designs: Sophie Fedorovich), The Wise Virgins (1940; music: J.S. Bach, orch. William Walton, designs: Rex Whistler); The Wanderer (1941; music: Schubert, designs: Graham Sutherland); The Quest (1943; music: Walton, designs: John Piper); Symphonic Variations 1946; music: César Franck, designs: Sophie Fedorovich). The discourse of wartime propaganda created specific notions of patriotism and Englishness, situating them within a general morality and making it essential not only to embrace these concepts but also to do so by visibly contributing to the war effort….Foucault’s concept of discourse … led me to explore how such emphatic notions of Englishness and the imperative to contribute to the wartime effort shaped Ashton’s ballets. The works he made between 1939 and 1946 were shaped not only by the demand of dance but also by factors outside of ballet, such as government ideology, cultural policy, funding, changes in performance venue, an increase in audiences and performances, and the proximity of and interaction with the prevailing artistic trends. By the same token, the need to make works which were in tune with wartime ideals, and Englishness in particular, probably gave rise to neo-romantic sources for the works and to the involvement of artists specifically connected with both the war and neo-romanticism. The present essay examines a film – A Canterbury Tale (1944) – which falls within the same historical context, addresses issues around the nature of wartime ideals, is potentially classifiable as neo-romantic and ostensibly promotes notions of Englishness. This unusual and fascinating work was created by The Archers, an extraordinary two-man team of film makers – an upper middle class English film director, Michael Powell (on the left in Fig. 1) who had started his career in France, and a Jewish-Hungarian writer, Emeric Pressburger, who in the 1930s had established himself as a script writer at the UFA studios in Berlin before having to flee the Nazis.2For Powell, see Michael Powell, A Life in Movies [hereafter ALIM] (London: Mandarin Paperbacks, 1992) and Million-Dollar Movie (London: Mandarin Paperbacks, 1993) and James Howard, Michael Powell (London: Batsford, 1996); for Pressburger, see Kevin Macdonald, Emeric Pressburger: The Life and Death of a Screenwriter (London: Faber & Faber, 1996), for their collaboration, see Ian Christie, Arrows of Desire: The Films of Michael Powell and Emeric Pressburger (London: Faber & Faber, 1985). Fig. 2. A list of the films made by The Archers, with the names of the composers responsible for the scores. In her article Morris goes on to argue that 3Op. cit., p. 170. Throughout the war, the British government endeavored to establish criteria of national identity. Ideas of what it meant to be British were formed in opposition to images of Nazi Germany. Compared with industrialised Germany, the English countryside was promoted as a haven of peace and stability and came to stand as one of the symbols of British identity. Wartime conditions initially provided the Archers with a very unusual working environment – light touch support from the Ministry of Information (which effectively funded nearly half of the production costs of 49th Parallel) and after the enormous success of that film, a more-or-less free hand in subject matter, treatment and realisation. The Archers seized this opportunity with both hands and it is notable that from 49th Parallel until A Matter of Life of Death (and again to a large extent in The Red Shoes) the screen plays were original: it so happens these films (along with an exception, Black Narcissus, based on a novel by Rumer Godden) are arguably their finest achievements. For Powell A Canterbury Tale was to be an intensely personal experience: he had been born and brought up in Kent and educated at the Cathedral School in Canterbury: the countryside he shows us in this film was in his bones. The black and white location photography of Kent by Erwin Hillier, the German cameraman (who learnt his craft with Fritz Lang)8He began as the camera assistant for Lang’s first sound film, M (see Kevin Macdonald, Emeric Pressburger: The Life and Death of a Screenwriter, London: Faber and Faber, 1996, 239) and had first worked with Powell on The Man Behind the Mask (1936) and then on the first Powell-Pressberger film, The Spy in Black (1939) (see Michael Powell A Life in Movies [hereafter ALIM] (London: Mandarin, 1992) 442–3.). is extraordinarily evocative and was one of the reasons why, when I first encountered the film I was profoundly disappointed that Vaughan Williams had not written the score – after all, he had done so for 49th Parallel (a huge critical and box-office success), and in 1943 was completing his Fifth Symphony, a ‘pastoral’ work which has musical connections with both his opera about a pilgrimage (Pilgrim’s Progress) and a pageant about urban sprawl (England’s Pleasant Land (1938). Recently I’ve changed my mind: had the manifest content of the film – its celebration of an imagined England – been reinforced by music by the composer who more than anyone created the musical embodiment of that ‘lost’ world, it would be even more difficult than it is to discern the latent content of the film, one which has other themes, and in part looks critically at the roots of that imagined world.9The composer of the score was Allan Gray (the name adopted by the Polish composer Józef Żmigrod (1902–75). Although he studied with Schoenberg in Berlin in the early 1920s his musical interests embraced popular music and jazz, and he developed a career in the theatre and films. It was presumably while working on the score of the 1931 film Emil und die Detektive that he came across Pressburger, who was helping Billy Wilder with the script. Gray was drawn into the Archers’s team to work in 1943 on an MOI recruitment film for the Royal Fleet Air Arm, The Volunteer, and the feature film The Silver Fleet. Thereafter he provided the scores for four of their finest films and after being dropped during work on The Red Shoes, continued a successful career in film and television, most notably as the composer of the score for The African Queen (1951). He was a friend of Walter Goehr (1903–1960) who conducted the music soundtrack of A Canterbury Tale, and was for a time the piano teacher of Goehr’s son, the composer Alexander Goehr (b. 1935). It is that latent content that I wish to explore here, and I’m encouraged in this by Powell’s own laconic (and un-amplified statement) that ‘“A Canterbury Tale” looked on the surface conventional, but was filled with subversive material.’10ALIM, p. 438. In the 1980s, Powell reported that11ALIM, 437. …the theme of ACT had grown organically in our minds, but it was not understood, or even enjoyed until thirty years later… In 1943 we were explaining to the Americans, and to our own people, the spiritual values and the traditions we were fighting for. What were these values? 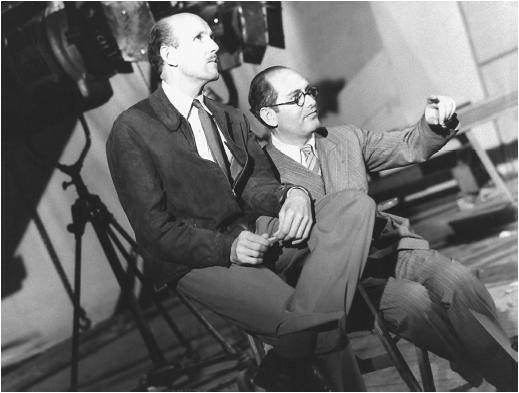 According to his grandson, Pressburger most admired English ‘fairness, the sense of humour and the endless fascinating manners and mores’ and in describing their previous film, Powell and Pressburger wrote to the MOI identifying another characteristic: an English anxiety to believe the best of people.12Macdonald, op. cit., 208. However, ACT sets these alongside an almost mystic sense of place, of rural harmony, and a sense of history and historical continuity – and in its latent content gently (or not so gently) examines the foundations and consequences of these notions. Moreover, this latent content is not one that either Powell or Pressburger seem to have publicly acknowledged in a direct way, as they did in the case of The Life and Death of Colonel Blimp, which explicitly argued that the war would not be won by adhering to outmoded forms of military behaviour.13The different ways in which they recalled the two films is strikingly apparent in the Arena profile “A Pretty British Affair”: Powell & Pressburger (BBC, November 1981), 15:50ff. (This was available on Youtube, https://www.youtube.com/watch?v=f24s-TlYXB0 (accessed 25.01.2017, but it has since been withdrawn). Given Churchill’s opposition to the earlier film, it would be understandable if the Archer’s were more circumspect in treating another potentially controversial theme: the restrictive social, gender-related and political attitudes that underpin the rural myth being appropriated as propaganda. Yet the film’s title, with its explicit reference to Chaucer, can be construed as signalling that an element of critique may part be of the work’s message. History frames the whole film with a quotation from the opening of Chaucer’s Canterbury Tales and a sequence showing the medieval pilgrims on their way to Canterbury.14All the clips used here are in the form of links to a two-part upload (8DGXb8REdIE and XcYhCt9u76g) on Youtube (accessed 25.01.2017); there is an alternative upload in one part, but the picture quality is less good (though in the upload used the backgrounds occasionally have a distracting life of their own). It is worth recalling that in the summer of 1918 Powell, with his brother John (who died shortly afterwards) and his mother, cycled part of the Pilgrims’ way, though in reverse, from Canterbury towards Southwark (see ALIM, 74–8, which records how this trip fed into A Canterbury Tale). At the end, it is the Cathedral itself that symbolises the physical goal of the original pilgrims and that of the film’s travelers, an embodiment of the past in the present. But at the opening the past and present are not conflated, but are juxtaposed in a famous visual gesture that caught the imagination of the London Correspondent for Variety magazine in 1944:15The review was first published on 31 May 1944 and is reproduced in Variety’s Film Reviews, 1943-1948 (New York: R.R. Bowker, 1983), unpaginated. A strikingly similar visual and narrative gesture is memorably used near the opening of Stanley Kubrick’s 2001: A Space Odyssey (1968), but Ian Christie has recently pointed out in a letter to the Times Literary Supplement, 6023 (7 September 2018), 6, that even if Kubrick had seen A Canterbury Tale before making his own film, it would have been the ‘severely truncated and re-ordered US version’, the only print available between the late 1940s and 1978, which omitted the sequence in question. It is also worth noting that the screenplay (BFI, Michael Powell Collection, S-56) reveals that at one stage it was planned that the gesture would be repeated: see below for further details. [F]irst honours go to Erwin Hillier, whose camera work is superb. Nothing more effectively by way of a time transition shot has been conceived here than the way he carries his audience through nine centuries in a few seconds. Beginning with a close-up of a hooded falcon on the wrist of an ancient Canterbury pilgrim… he follows the graceful bird as it soars aloft on speedy wings. When it becomes a mere speck, it turns and comes gliding back. On coming nearer, it is seen to be a Spitfire. An opening image of an ‘ancient’ map. In WB, this is the frontispiece to William Camden’s Britannia (1607); in ACT a faux-antique map of the pilgrims’ route to Canterbury. A voice over extract from a classic/ historic text. In WB the extracts purport to be from Camden’s Britannia;16They do not appear to be from Philemon Holland’s 1610 English translation as is usually asserted (see http://www.philological.bham.ac.uk/cambrit/ for the complete text). in ACT: Chaucer. In both cases the spoken text and image establish the ‘heritage’ propaganda trope at the outset. These elements appear later in ACT but in both films they establish the rural landscape and historic townscape dimensions within the propaganda trope. In both films this link is made between an ‘historical’ bird and a modern fighter aircraft. In WB it is achieved by the voice-over text from Milton’s Areopagitica (1644) with its evocation of an eagle, with film featuring Hawker Hurricanes; in ACT by juxtaposing images of a medieval hawk with a Supermarine Spitfire.17In connection with these two segments it is worth noting Adrian Dank’s observation that ‘the image of figures “looking up” was a dominant motif of wartime propaganda, signifying both a necessary vigilance and a countenance that looked towards postwar reconstruction’ (Adrian Danks: ‘The temperate zone’: Humphrey Jennings’ Words for Battle (http://sensesofcinema.com/2013/cteq/the-temperate-zone-humphrey-jennings-words-for-battle/). Later in ACT there are other scenes (mostly concerned with working life) that have an almost documentary authenticity, and in another respect the film adopts a characteristic that had sharply differentiated MOI films from the early propaganda efforts of commercial film producers: the complete absence of an on-screen love story.18For two egregious examples of the commercial approach, one might point to Convoy (Ealing, 1940) and Ships with Wings (Ealing 1941). In Powell and Pressberger’s first wartime feature films, this narrative element was also either of minimal significance (49th Parallel) or absent (One of Our Planes is Missing). If at the outset ACT establishes a tentative link with documentary propaganda, the film’s title, the quotation from Chaucer and the images make it clear that, unlike Jennings, who preferred a non-narrative approach, Powell and Pressburger had a story to tell, and significantly their prologue also offers the first statement of the overriding purpose of a pilgrimage: to receive a blessing or to do penance. However, the pilgrimage can also be a spiritual journey that is a learning process – as it is in Vaughan William’s Morality, The Pilgrim’s Progress (1944–49)19The first sketches date from 1906 and followed by more substantial work in the 1920s, but it was in the 1940s that Vaughan Williams brought the threads together and completed the work. 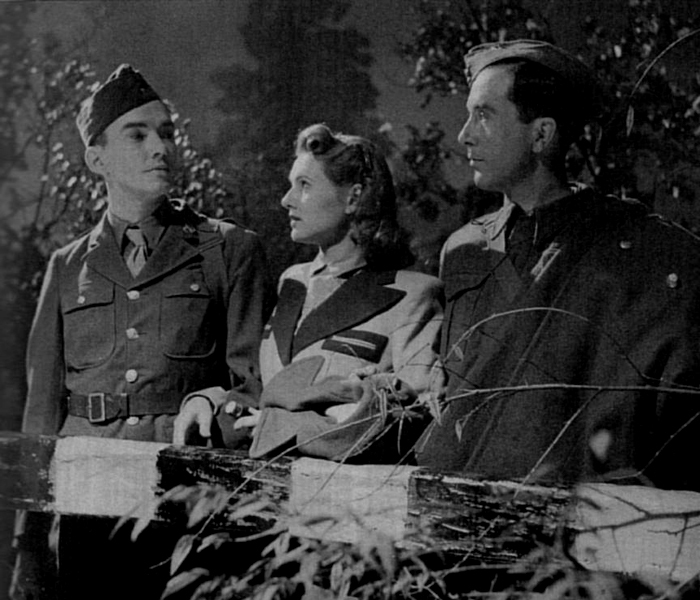 – and to a greater or lesser extent all four of the film’s central characters undergo such an inner journey as is tacitly portrayed in the central portion of the film and directly articulated by one of them in the finale, when the American soldier in the group finally meets his buddy in Canterbury. When asked what he’s been doing for two days, when he could have been enjoying the nightlife and girls in London, Bob replies: ‘learning, Sergeant Roczinsky, learning’. This is one of the film’s two overarching (and, I believe, related) narratives. The main, central portion of the film starts in the dark, at a railway station, as the American soldier, Bob gets off at the wrong stop: Chillingbourne, not Canterbury. There he meets Alison – a member of the land army – and Peter a soldier just posted. 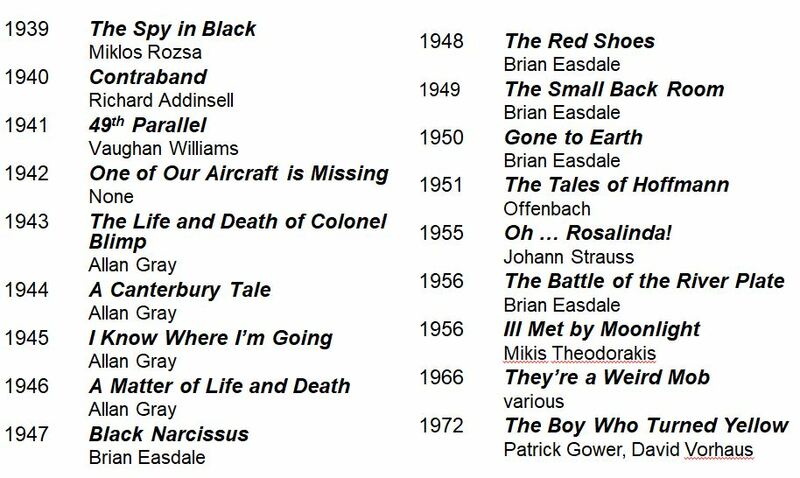 Have suffered loss20First noted by Andrew Moor in Powell & Pressburger: A Cinema of Magic Spaces (London: I.B. Tauris, 2005), 87–8. b) from America to England. It is perhaps no surprise that the experience of being a stranger, and outsider, is explored in a number of Pressburger scripts, but never more powerfully than in The Life and Death of Colonel Blimp and A Canterbury Tale. As they walk to the village Alison is attacked by someone, apparently in uniform, who pours glue on her hair. That glue-pouring must be construed as having a strong sexual element renders it even more extraordinary that it was deemed less objectionable than the slashing of the victim’s clothes, the originally planned form of the attacks.21See A Short Guide to A CANTERBURY TALE to be Written, Produced & Directed by MICHAEL POWELL & EMERIC PRESSBURGER, a duplicated typescript outline of the film dated 22.4.43 (BFI Archive, Michael Powell Collection, S-53, p. 2). I am most grateful to the Michael Powell Estate for permission to examine various items held at the BFI, and to Victoria Bennett of the BFI for her help and advice. It is another instance of the film taking up a theme (in this case, violence against women) explored elsewhere in the Archer’s output – in the dismemberment of characters played by Moira Shearer in both The Red Shoes and Tales of Hofmann and in the voyeuristic sexual murders in Powell’s own solo effort, Peeping Tom (1960). Such sexual violence is a deeply disturbing element, one so dark that Robert Livesey (who had memorably starred in Blimp) refused the role especially written for him in A Canterbury Tale.22According to the comment by Michael Powell quoted in the catalogue record for BFI Special Collections ITM-18408 (A Short Guide to A CANTERBURY TALE to be Written, Produced & Directed by MICHAEL POWELL), Deborah Kerr, who had co-starred with Livesy in Blimp, refused to role Alison for similar reasons, although in ALIM, pp. 438–41 he explains that is was because MGM had acquired a contract with Kerr that she was unavailable for ACT. Nevertheless, early in the passage he also admits that ‘Deborah may have had her doubts’. The parts were eventually played by Eric Portman, who had starred in The 49th Parallel, and Sheila Sim, a relative newcomer. However, from a narrative perspective it is important to remember that this attack has to be serious enough to initiate the second of the two narratives in the film: the solution of a mystery, the identification of the Glueman. c) The fate of the unmasked wrong-doer can be in the form of a penance, one of the possible goals of a pilgrimage. In this context it is interesting that Pressburger undermines the element of suspense in the detective story early on: the leading characters in the film and the audience have strong circumstantial evidence about the attacker’s identity. Admittedly this to some extent vitiates the power of the narrative impetus provided by the crime-solving strand, but it allows for a discursive detective narrative that can effortlessly accommodate an exploration of English mores, manners and landscape, and whose quiet progress is visually paralleled by the slender, meandering course of the river Stour seen wending its way through Kent towards Canterbury (see Clip 3). In later years Powell identified this narrative strand as one of the films weaknesses: ‘In spite of Emeric’s valiant attempts to turn it into a detective thriller, the story of A Canterbury Tale remained a frail and unconvincing structure,'23ALIM, 447. but one need not concur. To have grafted on elements of a conventional detective thriller would have inevitably run counter to the overriding tone of the film and many of its themes.24Powell’s reference to the ‘detective thriller’ can be read as a direct reference to one of the major sub-genres of British cinema in the 1930s: towards the end of the decade a variation, the espionage thriller, emerged in films such as The Spy in Black (1939) and Contraband (1940) by Powell and Pressburger (see James Chapman, ‘Celluloid Shockers’, in The Unknown 1930s: An Alternative History of the British Cinema, 1929–1939, ed. Jeffrey Richards (London: I.B. Tauris, 1998), 75–98). On the other hand, Powell might actually have had in mind a ‘peculiarly English’ variation of the genre, the mystery thriller, ‘tales of nefarious doings in rural surroundings and sleepy hamlets, of amateur sleuths and wronged innocents (Geoff Brown, ‘Money for Speed: The British Films of Bernard Vorhaus’, ibid., 188). Moreover, one might counter that the outcomes of pilgrimages were not foregone conclusions, and that in this case the question as to whether justice has been seen to be done at the end is (apparently intentionally) left open in the version released in 1944. After the attack on Alison Peter has to report to his camp, but Bob and Alison have to report to the police at the town hall – modeled on that of Fordwich25Paul Tritton, A Canterbury Tale: Memories of a Classic Wartime Movie (Canterbury: E.C. Parker & Co. (Services) Ltd, 2006) pp. 32–33). This is a good introduction to the Kent locations and has numerous photographs of the cast and crew during filming. – and there they separately meet the other central character, Thomas Colpeper, J.P.26The four main characters are not listed in the end credits, and so I’ve adopted the spelling ‘Colpeper’ (rather than ‘Colpepper’) used in the programme for the world premiere on 11 May 1944 (reproduced, loc. cit., 9) and in all the original documents consulted at the BFI. These interviews are ostensibly to introduce themselves to the local authority figure, but through them we learn quite a lot about Colpeper. As he talks to Bob he is shown to be genial, generous, polite and has a deep (and as we will later learn, almost mystical) love of English history and landscape. The principal local landowner is a Justice of the Peace. This J.P. has only been a magistrate since 1938. He is young for the position. He owns some hundreds of acres and a fine old house with a large garden, and he has some very strong views about the English countryside. For him the big cities, the great industrial districts, are to the country what the foliage is to the tree. The leaves come and go, and come again. The tree remains. And if the tree goes – everything goes. He is a fanatic in his beliefs. In describing Colpeper’s room the screenplay gives further insight into The Archers’ conception of the character:29Screenplay (n.d.), Sequence 27, p. 26 (BFI Archive, Michael Powell Collection, S-56). The room, like the hall, is the room of a man of action, but a solitary. There are two types of English sportsman; there is the man who plays against other men: the cricketer, the footballer, the tennis-player, the rower, the runner; and there is the man who pits his strength and his wits – and often his life – alone, against Nature: the mountaineer, the canoe-ist, the fisherman, the hunter. This last is the type of man in whose room Peter finds himself. During the body of the film we learn (or can infer that) Colpeper too has suffered a loss: of a patriarchal social stability that guaranteed political power and influence to a local squire such as himself. His intense engagement with the local heritage can be understood as in part a response to the social, agricultural and political changes of the 20th century, and the ‘earthquake’ caused by the war. Just how deeply unsettled he has been, is manifest when his irrational response – as the village’s Glueman – is gradually confirmed. During the film he too will undertake a pilgrimage and will have his assumptions challenged – appropriately enough by a woman, Alison. Although ultimately he accepts that his journey to Canterbury is to do penance, the 1944 released version is equivocal about the extent to which he learns from this experience. The morning after their arrival Alison and Bob meet up in the wheelwright’s yard and begin their search for clues about the identity of the Glueman. But the scene is also important as one of the crucial portrayals of the imagined village, and as such a component in a quasi-symmetrical non-narrative structure. Preparations for war figure in the prologue (training) and the finale (a parade of, and service for, the troops about to ship out); within this frame we have two important scenes that embody different aspects of the rural myth – first the imagined community, then idealised nature and landscape. These enclose two sequences that portray the new roles women were taking on, and at the almost exact chronological centre the enactment of war by the boys of the village. This, like the Allied invasions of North Africa (November 1942) and Sicily (July 1943), anticipates D-Day – it is an amphibious attack – and seems to capture both the pointlessness of war and, in the image of the youngest, ‘General Todd’ ( played by David Todd) crying his eyes out in the boat, a poignant reminder of the pity of war.30The chronological location of the boys’ battle in the surviving screenplay is rather earlier than in the film: see the Appendix for an overview of the omission and re-ordering of scenes after the preparation of the screenplay. Fig. 7. 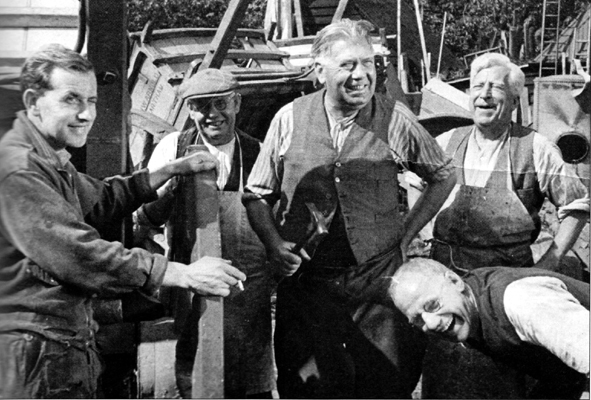 Eric Horton, Ben Horton, George Merritt (Ned, the blacksmith), Edward Rigby (Jim, the wheelwright), Neville Horton. All three of the Hortons appear as extras in the scene at the wheelright’s yard. This imagined village is contrasted two scenes later with a much more unconventional sequence set in the farm of Alison’s new employer: in one shot we see them working hard, shoveling manure: one of the aspects of rural life normally omitted from the myth. The other unconventional aspect tells us something of the earthquake Colpeper has experienced: Alison’s boss is a woman (Susanna’s sister) who sacrificed the chance of marriage to remain working the land and, in the screenplay comments ‘I’m still a maid – an old ‘un, but a free one. '32In the released version only the first phrase, ‘I’m still a maid’ is retained. In the later sequence centering around women, Alison tracks down other victims of the Glueman and she finds three, all of them in jobs previously associated with men – bus driver, signalwoman and postwoman – encroaching on male preserves. One of the paradoxes in this film is that while almost all of it represents, through its images, a unambiguous celebration of the Kent countryside, on the sound track a strong personal connection to English history and landscape is articulated by the most ambiguous and compromised character in the film. Colpeper expresses his appreciation first at one of the lectures he offers to soldiers from the nearby camp. There is an understated eloquence, a quiet and intense sincerity in Eric Portman’s performance that can be very compelling. But the way this scene is shot is striking, atmospheric and ambiguous, clearly drawing on Hillier’s training with Fritz Lang. Elsewhere Powell and Hillier exploit the potential of the wartime blackout to offer opportunities for striking lighting effects, but here the blackout is of the opposite type: not keeping light in, but keeping it out. Colpeper is asked why he wants to lecture at all:33This was a relatively late change: earlier he had offered the explanation unprompted (Screenplay, sequence 21 (BFI Michael Powell Collection, S-56). his reply is that it’s a natural desire to pass on what you know. But his actions supplement that answer – like all lectures (and essays) – it’s partly self-projection. It is Colpeper who turns on the lantern to reveal himself in silhouette against the screen. But this was shot and lit in a notable way: the projection is circular – it took the team a lot of deliberate effort to achieve this – creating a halo (echoed in another halo towards the end of the film where it is associated by his (apparently) most implacable protagonist). But the camera is placed just to one side so that Colpeper is black against the screen, though lit from above: the handling of light is sending a deliberately ambiguous message here. This clip also makes clear Colpeper’s limited social perspectives when he lists the possible civilian occupations of his conscripted audience: cooks, doctors, lawyers, clerks, merchants. For the most part the film does not explore the social context or the extent of the relevance of the rural vision it offers: it is only the scene with the hop pickers early on and, perhaps, the village boys (no gender balance) that briefly represent the working class. Nevertheless it is the boys, playing with their new football, who end the film behind the final credits, though perhaps more to offer an upbeat vision of the young playing at sport (as opposed to war games), rather than a late attempt to redress the film’s social balance.34Pressburger’s grandson, writing of One of our aircraft is missing… comments ‘Inevitably, a British writer would have made more of class differences. Emeric did not share that obsession.’ Kevin Macdonald, Emeric Pressburger: The Life and Death of a Screenwriter (London: Faber and Faber, 1996), 192. In this context it is Alison who has an ambiguous social position: Bob and Peter are solidly middle-class, but she was a shop girl, who is not deemed suitable by her fiancé’s family. In a fascinating interview,35Included on the 2-DVD edition of the film issued by Criterion in 2006 (Criterion Collection 341; N.B. available for Region 1 only). Sheila Sim reflected on the actorial accent she had been trained to adopt and its relevance to the film: in many respects her performance is very engaging and emotionally apt (particularly in this scene, and later when she visits her fiancé’s caravan) but a less home-counties accent might have made her status as a representative of the urban working class more apparent.36Here the difference between the Archer’s perspective and that of Jennings and much wartime propaganda are clear: social diversity and cohesion in the face of an external threat were common themes in the work of the latter. b) Because another of Colpeper’s assumptions (he had earlier misjudged Bob) is challenged: it turns out that a woman, Alison, has greater, more direct access to the past than he has. It is also striking that it is only after Colpeper’s accidental trip over the power cable ensures that the light must be let back into the room – he temporarily loses control of his self-projection – that Alison’s revelation is announced. Alison’s challenge to Colpeper has a consequence later in the second half of the film, in the sequence where heritage mysticism is at its height: as she walks along the pilgrim’s way she sees the Cathedral, and hears (or thinks she hears) the pilgrims, and accidentally meets Colpeper.37Interestingly it had been envisaged that Peter, too, would have this auditory experience, while standing outside the Police Station in Canterbury (see the Screenplay, sequence 34: BFI, Michael Powell Collections, S-56): this would have suggested that even the relatively unempathetic Peter had gained a new range of sensitivity, but it was omitted from the final version. Here they are both in the light, and Colpeper apologises for misjudging her. Not only that, but an intimacy and trust is established – there is a strong sense that Colpeper might genuinely have learnt lessons, but at the end of the scene he and Alison overhear Bob and Peter talking in a way that reveals they know that Colpeper is the Glueman. Alison: Mr Colpeper, didn’t it ever occur to you to ask the girls to your lectures? Her final word in the exchange is full of meaning: apparently an evasion, an avoidance of direct conflict, its latent contents include both irony and critical assessment made more powerful by their ‘under’ statement. c) That Bob’s ‘he meant well’ (referring to the Glueman) could be used in an attempt to justify any crime. Colpeper implies that he goes to Canterbury to do penance, but his capacity for transformation, so strongly projected in the previous scene, seems almost or entirely absent here: he sits in judgement of others, but does not believe human justice extends to himself. Moreover, the extent to which his fellow pilgrims are apparently willing to acquit him because of his ‘good’ intentions encourages the viewer to consider the consequences of the English tendency to ‘always think the best of people’. That Colpeper’s pilgrimage is perhaps on-going may be part of the message: that there is always a fine line between engagement with one’s culture, land and landscape, and its shadow – bigoted, totalitarian nationalism – and that we have to constantly re-learn that distinction. Just how easy it was to cross the line was demonstrated in the 1930s by some of the early English advocates of agrarian revival (founded, at least in part, on ecological principles), like Gerald Wallop (1898–1984; Viscount Lymington from 1943) of the English Mistery and later the English Array, and Jorian E.F. Jenks (1899–1963, a member of the British Union of Fascists from 1932), some of whose ideas have elements in common with Colpeper’s, and who both slipped easily into various native brands of fascism.39For a broad introduction to these groups, and a more detailed account of Jenks, who from 1945 edited the Soil Association’s journal Mother Earth, see Richard Moore-Colyer, ‘Towards ‘Mother Earth’: Jorian Jenks, Organicism, the Right and the British Union of Fascists’, Journal of Contemporary History, 39/3 (2004), 353–71. 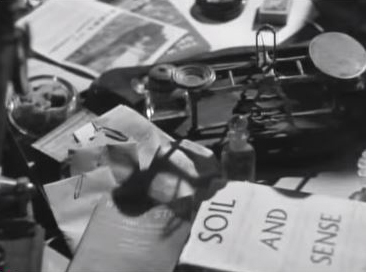 One detail from the scene where Peter visits Colpeper may be designed to signal Colpeper’s interest in the ecological issues that formed a strand in the agrarian revival movement: as the camera pans over the items on his desk, a copy of an early edition of Soil and Sense, by Michael Graham (London: Faber and Faber, 1941) is prominent among them.40It should be stressed that Graham’s fascinating book is solely ecological in perspective and has no polemical political component, although it raises concerns about impact of mechanisation and industrialisation within farming. (Godfrey) Michael Graham was born into an academic Quaker family in Greater Manchester on 22 February 1898 (his father, John William Graham (1859-1932) was a mathematics tutor at Owens College, and Principal of Dalton Hall) and was educated at a Quaker school before going up to Cambridge. He described himself as a naturalist and joined the Lowestoft Fisheries Laboratory in 1920 where he was subsequently appointed Principal Naturalist in 1944 and Director of Fishery Investigations in 1945. He retired in February 1959 and following his death in 1972 his former colleagues established (1974) an endowment for the Michael Graham Prize for students at the University of East Anglia: three prizes of £100 are offered annually for work in the biological and environmental sciences. Graham’s second book, The Fish Gate (London: Faber and Faber, 1943), addresses the issue of over-fishing, and is notable for citing Das Kapital (Marx) in the context of the growing industrialisation of the fishing industry. I should like to thank Sarah Carter (Cefas) for directing me to Arthur J. Lee, The Ministry and Agriculture, Fisheries and Food’s Directorate of Fisheries Research: its Origins and Development (Lowestoft: Ministry of Agriculture, 1992) which provides much information about Graham and his work at Lowestoft. See also the excellent Wikipedia entry. Given his statements and actions, one might suspect that Colpeper would have had some sympathy with the non-agrarian views of more extreme advocates of the revival, such as Wallop and Jenks. Another facet of Colpeper’s complex role is the way that, despite his narrative function as the villain to be unmasked, he actually embodies positive and, to a degree, negative characteristics of one of the most popular heroes of the 1930s British detective thriller genre, Bulldog Drummond: ‘an English gentleman who represents the traditional values of honesty, sportsmanship, chivalry and patriotism … [but] sometimes seems little more than a fascist bully with a polished accent. '41James Chapman, op. cit., p. 90. Colpeper very eloquently tells his audiences (virtual and real) how they should think about their country, but the ‘frail’ structure of the detective story offers a different approach: it shows three individuals of different cultures, genders and class collaborating, discovering during their clever, evidence-based and successful investigation, a more inclusive appreciation of and respect for many of the aspects of Englishness dear to Colpeper. Thus the film embodies the contrasting notions of how to fashion successful propaganda that were played out within the MOI and in wider contemporary debates, while also raising concerns about possibly unwelcome consequences of a simplistic (or cynical) exploitation of the ‘heritage’ trope in war-time propaganda. From this perspective, Powell was right: in 1944 this film was subversive, questioning aspects of the Ministry of Information’s propaganda strategy it purported to endorse; and it remains an important message. At Canterbury the other pilgrims receive their blessings: Alison’s fiancé is safe in Gibraltar and Bob receives letters from his girlfriend, both accompanied by the Pilgrims’ Blessing motive in the soundtrack. Peter’s blessing is perhaps more interesting because his journey involves the most radical inner transformation and its significance is signaled by the halo that surrounds him as the train pulls into Canterbury. In the 1944 release he initially plays a less significant role than Alison or Bob, and only gradually assumes authority.42The screenplay reveals that his character originally played a much more important role: in a substantial section at the end of Sequence 10 that did not find its way into the final print, having reported to his camp, he rejoins Bob and Alison at ‘The Hand of Glory’, and it is he (not Alison) who persuades Bob to stay on to try to accumulate evidence of Colpeper’s activity as the Glue-man. (The opening of the revised Sequence 11 was presumably added in response to the deletion of this segment of the preceding Sequence.) Later, in the unused Sequence 25 it emerges during a conversation with Bob that Peter was actually rather successful as a musician, and has broadcast on the BBC. In some respects the revisions diminish the explicitness with which Peter’s pilgrimage is portrayed, and it is Alison, the victim, who takes priority in the investigation, a notable shift of emphasis in line with the treatment of gender elsewhere in the film. Moreover, unlike them he had neither an experience-based nor an acquired sympathy for rural life, and admits that before the war he hardly realised the countryside existed. At the end it is he who plans to denounce Colpeper, but he finds himself at the Cathedral. Earlier Bob had teased him for being out of breath while they walk over the downs, saying he thought climbing all those stairs kept organists fit: Peter’s response is that he takes the lift (he is a cinema organist), typical of his original, jaded exterior. Now he climbs two flights of stairs to see the cathedral organ and realises a long-suppressed artistic ambition by playing for the service being held for his battalion as they prepare to leave for war. His blessing makes for a suitable climax to this modern pilgrimage. We see the bells, great and small, shaking the timbers of the roof with their clamour. We see the towers of the Cathedral, the Angel Steeple, the mass of the building. The bells are still ringing. There is no sign to show whether the time is 600 years ago or today. We see the Cathedral, far away across the valley of the Stour, the houses of Canterbury huddled round it. The bells sound faintly, but the Organ is still playing. High up white clouds are sailing in the wind. A small black speck appears in the sky. It’s familiar hum breaks through the organ music. It is a Spitfire. The camera sweeps down from the sky, down to Chillingbourne Camp. A new battalion of SOLDIERS are marching in to take over. This time they are Americans. We see their faces as they march: faces not very different from the faces we left in prayer at Canterbury. Only the uniforms are different. A brand new football! There they go! Leslie, Terry and the other boys, one side, with berets, fighting unequal odds. Here is the ‘Colpeper Institute’. There is a new poster up, advertising a series of lectures. And – believe it or not! – soldiers and girls are going in. 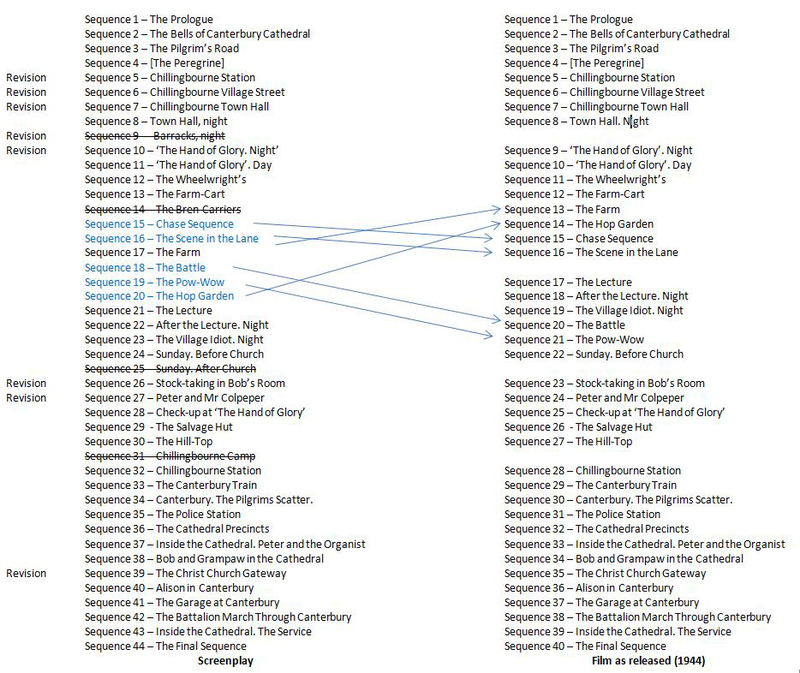 The shots of the Cathedral (a few of which do appear in the released version) and the recapitulated Spitfire sequence reinforce the atemporal symmetrical structure of the film, and seem to be designed to close off the narrative, but the last two images behind the closing credits – the boys and the poster – for all their ambiguous status both within and outside the ostensibly completed chronicle, seem to be intended as glimpses of an imagined sequel and the last would have suggested that Colpeper’s penance was genuine and that for him the pilgrimage had indeed been a significant learning experience after all. However, by omitting that final image (which would have revealed what the outcome would be) Powell and Pressburger encourage viewers to make up their own minds about the character’s ultimate spiritual fate. One of life’s ironies is that the public response to Colpeper’s lectures was echoed by the attitude of cinema audiences to the film. They stayed away in droves. We can speculate about the reasons, while noting that it has become a cult movie, indeed a heritage movie, with tours arranged for (mainly middle-aged) admirers to visit the locations used in it. In 1944 audiences were perhaps aware but uninterested in the latent content, the undertones; now, in a rapidly and unpredictably changing world, perhaps we need to rediscover them. The left-hand column lists the sequences as found in the screenplay (BFI, Michael Powell Collection, S-56): the numbering and titles are those of the original document. Those marked ‘Revision’ are so identified in the screenplay: in most cases this indicates that the text in that document replaced an earlier version of the sequence concerned, but in the case of Sequence 9 it indicates explicitly that the Sequence had already been removed. Fortunately its title, and something of the content of this sequence can be construed from details in the Technical Breakdown (BFI, Michael Powell Collection, S-55A). Sequences not used in the 1944 release are crossed through. The right-hand column lists the the sequences used in the 1944 release: the renumbering is editorial. 1. ↑ Geraldine Morris, ‘Ashton’s Ballets of the Second World War’, Dance Research: The Journal of the Society for Dance Research, 26/2 (Winter 2008), 169. The ballets were Dante Sonata (1940; music: Liszt orch. Lambert, designs: Sophie Fedorovich), The Wise Virgins (1940; music: J.S. Bach, orch. William Walton, designs: Rex Whistler); The Wanderer (1941; music: Schubert, designs: Graham Sutherland); The Quest (1943; music: Walton, designs: John Piper); Symphonic Variations 1946; music: César Franck, designs: Sophie Fedorovich). 2. ↑ For Powell, see Michael Powell, A Life in Movies [hereafter ALIM] (London: Mandarin Paperbacks, 1992) and Million-Dollar Movie (London: Mandarin Paperbacks, 1993) and James Howard, Michael Powell (London: Batsford, 1996); for Pressburger, see Kevin Macdonald, Emeric Pressburger: The Life and Death of a Screenwriter (London: Faber & Faber, 1996), for their collaboration, see Ian Christie, Arrows of Desire: The Films of Michael Powell and Emeric Pressburger (London: Faber & Faber, 1985). 3. ↑ Op. cit., p. 170. 4. ↑ These difficulties are charted with impressive documentation in the opening chapters 0f James Chapman, The British At War: Cinema, State and Propaganda 1939–1945 (London: J.B. Tauris, 1998). 5. ↑ It was shown to the trade on 17 October and released on 3 November 1939: ibid., 62. 6. ↑ Ibid., pp. 60, 63–4, 265, n. 21; in a unique arrangement Korda granted the MOI a percentage of the box office takings, and by May 1944 the public purse had received £25,140 (ibid., 62). 8. ↑ He began as the camera assistant for Lang’s first sound film, M (see Kevin Macdonald, Emeric Pressburger: The Life and Death of a Screenwriter, London: Faber and Faber, 1996, 239) and had first worked with Powell on The Man Behind the Mask (1936) and then on the first Powell-Pressberger film, The Spy in Black (1939) (see Michael Powell A Life in Movies [hereafter ALIM] (London: Mandarin, 1992) 442–3.). 9. ↑ The composer of the score was Allan Gray (the name adopted by the Polish composer Józef Żmigrod (1902–75). Although he studied with Schoenberg in Berlin in the early 1920s his musical interests embraced popular music and jazz, and he developed a career in the theatre and films. It was presumably while working on the score of the 1931 film Emil und die Detektive that he came across Pressburger, who was helping Billy Wilder with the script. Gray was drawn into the Archers’s team to work in 1943 on an MOI recruitment film for the Royal Fleet Air Arm, The Volunteer, and the feature film The Silver Fleet. Thereafter he provided the scores for four of their finest films and after being dropped during work on The Red Shoes, continued a successful career in film and television, most notably as the composer of the score for The African Queen (1951). He was a friend of Walter Goehr (1903–1960) who conducted the music soundtrack of A Canterbury Tale, and was for a time the piano teacher of Goehr’s son, the composer Alexander Goehr (b. 1935). 10. ↑ ALIM, p. 438. 12. ↑ Macdonald, op. cit., 208. 13. ↑ The different ways in which they recalled the two films is strikingly apparent in the Arena profile “A Pretty British Affair”: Powell & Pressburger (BBC, November 1981), 15:50ff. (This was available on Youtube, https://www.youtube.com/watch?v=f24s-TlYXB0 (accessed 25.01.2017, but it has since been withdrawn). 14. ↑ All the clips used here are in the form of links to a two-part upload (8DGXb8REdIE and XcYhCt9u76g) on Youtube (accessed 25.01.2017); there is an alternative upload in one part, but the picture quality is less good (though in the upload used the backgrounds occasionally have a distracting life of their own). It is worth recalling that in the summer of 1918 Powell, with his brother John (who died shortly afterwards) and his mother, cycled part of the Pilgrims’ way, though in reverse, from Canterbury towards Southwark (see ALIM, 74–8, which records how this trip fed into A Canterbury Tale). 15. ↑ The review was first published on 31 May 1944 and is reproduced in Variety’s Film Reviews, 1943-1948 (New York: R.R. Bowker, 1983), unpaginated. A strikingly similar visual and narrative gesture is memorably used near the opening of Stanley Kubrick’s 2001: A Space Odyssey (1968), but Ian Christie has recently pointed out in a letter to the Times Literary Supplement, 6023 (7 September 2018), 6, that even if Kubrick had seen A Canterbury Tale before making his own film, it would have been the ‘severely truncated and re-ordered US version’, the only print available between the late 1940s and 1978, which omitted the sequence in question. It is also worth noting that the screenplay (BFI, Michael Powell Collection, S-56) reveals that at one stage it was planned that the gesture would be repeated: see below for further details. 16. ↑ They do not appear to be from Philemon Holland’s 1610 English translation as is usually asserted (see http://www.philological.bham.ac.uk/cambrit/ for the complete text). 17. ↑ In connection with these two segments it is worth noting Adrian Dank’s observation that ‘the image of figures “looking up” was a dominant motif of wartime propaganda, signifying both a necessary vigilance and a countenance that looked towards postwar reconstruction’ (Adrian Danks: ‘The temperate zone’: Humphrey Jennings’ Words for Battle (http://sensesofcinema.com/2013/cteq/the-temperate-zone-humphrey-jennings-words-for-battle/). 18. ↑ For two egregious examples of the commercial approach, one might point to Convoy (Ealing, 1940) and Ships with Wings (Ealing 1941). In Powell and Pressberger’s first wartime feature films, this narrative element was also either of minimal significance (49th Parallel) or absent (One of Our Planes is Missing). 19. ↑ The first sketches date from 1906 and followed by more substantial work in the 1920s, but it was in the 1940s that Vaughan Williams brought the threads together and completed the work. 20. ↑ First noted by Andrew Moor in Powell & Pressburger: A Cinema of Magic Spaces (London: I.B. Tauris, 2005), 87–8. 21. ↑ See A Short Guide to A CANTERBURY TALE to be Written, Produced & Directed by MICHAEL POWELL & EMERIC PRESSBURGER, a duplicated typescript outline of the film dated 22.4.43 (BFI Archive, Michael Powell Collection, S-53, p. 2). I am most grateful to the Michael Powell Estate for permission to examine various items held at the BFI, and to Victoria Bennett of the BFI for her help and advice. 22. ↑ According to the comment by Michael Powell quoted in the catalogue record for BFI Special Collections ITM-18408 (A Short Guide to A CANTERBURY TALE to be Written, Produced & Directed by MICHAEL POWELL), Deborah Kerr, who had co-starred with Livesy in Blimp, refused to role Alison for similar reasons, although in ALIM, pp. 438–41 he explains that is was because MGM had acquired a contract with Kerr that she was unavailable for ACT. Nevertheless, early in the passage he also admits that ‘Deborah may have had her doubts’. The parts were eventually played by Eric Portman, who had starred in The 49th Parallel, and Sheila Sim, a relative newcomer. 24. ↑ Powell’s reference to the ‘detective thriller’ can be read as a direct reference to one of the major sub-genres of British cinema in the 1930s: towards the end of the decade a variation, the espionage thriller, emerged in films such as The Spy in Black (1939) and Contraband (1940) by Powell and Pressburger (see James Chapman, ‘Celluloid Shockers’, in The Unknown 1930s: An Alternative History of the British Cinema, 1929–1939, ed. Jeffrey Richards (London: I.B. Tauris, 1998), 75–98). On the other hand, Powell might actually have had in mind a ‘peculiarly English’ variation of the genre, the mystery thriller, ‘tales of nefarious doings in rural surroundings and sleepy hamlets, of amateur sleuths and wronged innocents (Geoff Brown, ‘Money for Speed: The British Films of Bernard Vorhaus’, ibid., 188). 25. ↑ Paul Tritton, A Canterbury Tale: Memories of a Classic Wartime Movie (Canterbury: E.C. Parker & Co. (Services) Ltd, 2006) pp. 32–33). This is a good introduction to the Kent locations and has numerous photographs of the cast and crew during filming. 26. ↑ The four main characters are not listed in the end credits, and so I’ve adopted the spelling ‘Colpeper’ (rather than ‘Colpepper’) used in the programme for the world premiere on 11 May 1944 (reproduced, loc. cit., 9) and in all the original documents consulted at the BFI. 27. ↑ BFI Archive, Michael Powell Collection, S-53, p. 1. 28. ↑ Screenplay (n.d.), Sequence 10 (BFI Archive, Michael Powell Collection, S-56). 29. ↑ Screenplay (n.d.), Sequence 27, p. 26 (BFI Archive, Michael Powell Collection, S-56). 30. ↑ The chronological location of the boys’ battle in the surviving screenplay is rather earlier than in the film: see the Appendix for an overview of the omission and re-ordering of scenes after the preparation of the screenplay. 32. ↑ In the released version only the first phrase, ‘I’m still a maid’ is retained. 33. ↑ This was a relatively late change: earlier he had offered the explanation unprompted (Screenplay, sequence 21 (BFI Michael Powell Collection, S-56). 34. ↑ Pressburger’s grandson, writing of One of our aircraft is missing… comments ‘Inevitably, a British writer would have made more of class differences. Emeric did not share that obsession.’ Kevin Macdonald, Emeric Pressburger: The Life and Death of a Screenwriter (London: Faber and Faber, 1996), 192. 35. ↑ Included on the 2-DVD edition of the film issued by Criterion in 2006 (Criterion Collection 341; N.B. available for Region 1 only). 36. ↑ Here the difference between the Archer’s perspective and that of Jennings and much wartime propaganda are clear: social diversity and cohesion in the face of an external threat were common themes in the work of the latter. 37. ↑ Interestingly it had been envisaged that Peter, too, would have this auditory experience, while standing outside the Police Station in Canterbury (see the Screenplay, sequence 34: BFI, Michael Powell Collections, S-56): this would have suggested that even the relatively unempathetic Peter had gained a new range of sensitivity, but it was omitted from the final version. 39. ↑ For a broad introduction to these groups, and a more detailed account of Jenks, who from 1945 edited the Soil Association’s journal Mother Earth, see Richard Moore-Colyer, ‘Towards ‘Mother Earth’: Jorian Jenks, Organicism, the Right and the British Union of Fascists’, Journal of Contemporary History, 39/3 (2004), 353–71. 40. ↑ It should be stressed that Graham’s fascinating book is solely ecological in perspective and has no polemical political component, although it raises concerns about impact of mechanisation and industrialisation within farming. (Godfrey) Michael Graham was born into an academic Quaker family in Greater Manchester on 22 February 1898 (his father, John William Graham (1859-1932) was a mathematics tutor at Owens College, and Principal of Dalton Hall) and was educated at a Quaker school before going up to Cambridge. He described himself as a naturalist and joined the Lowestoft Fisheries Laboratory in 1920 where he was subsequently appointed Principal Naturalist in 1944 and Director of Fishery Investigations in 1945. He retired in February 1959 and following his death in 1972 his former colleagues established (1974) an endowment for the Michael Graham Prize for students at the University of East Anglia: three prizes of £100 are offered annually for work in the biological and environmental sciences. Graham’s second book, The Fish Gate (London: Faber and Faber, 1943), addresses the issue of over-fishing, and is notable for citing Das Kapital (Marx) in the context of the growing industrialisation of the fishing industry. I should like to thank Sarah Carter (Cefas) for directing me to Arthur J. Lee, The Ministry and Agriculture, Fisheries and Food’s Directorate of Fisheries Research: its Origins and Development (Lowestoft: Ministry of Agriculture, 1992) which provides much information about Graham and his work at Lowestoft. See also the excellent Wikipedia entry. 41. ↑ James Chapman, op. cit., p. 90. 42. ↑ The screenplay reveals that his character originally played a much more important role: in a substantial section at the end of Sequence 10 that did not find its way into the final print, having reported to his camp, he rejoins Bob and Alison at ‘The Hand of Glory’, and it is he (not Alison) who persuades Bob to stay on to try to accumulate evidence of Colpeper’s activity as the Glue-man. (The opening of the revised Sequence 11 was presumably added in response to the deletion of this segment of the preceding Sequence.) Later, in the unused Sequence 25 it emerges during a conversation with Bob that Peter was actually rather successful as a musician, and has broadcast on the BBC. In some respects the revisions diminish the explicitness with which Peter’s pilgrimage is portrayed, and it is Alison, the victim, who takes priority in the investigation, a notable shift of emphasis in line with the treatment of gender elsewhere in the film.